Carolina Herrera 212 Men Surf is dedicated to summer recreation & sports. Carolina Herrera 212 Men Surf 100ml. Eau De Toilette - Playful, sensual and energetic essence, that is perfect for hot summer days. Charismatic composition, from whose intense haze to inspire you in your daily life. Scented Entertainment, which found its basis in aquatic tones. Carolina Herrera 212 Surf's eau de toilette for men who like to indulge in sea flavor. Now it is interlinked components, such as grapefruit and patchouli. It is a purely refreshing and cooling smell with which you can work on improving their ambitions. See to it that the summer will be in perfect and fresh spirit. The delicious flavor of toilet water for Men Carolina Herrera 212 Surf is also linked with the design itself bottle. He relies on light blue symbols and palms. In short, Hawaii, you are with this composition at hand. Succumb nested freshness of ingredients and enjoy life. This eau de toilette embodiment of youthful energy. Imagine a cheerful company of young people, carelessly resting on the beach. Boys and girls having fun talking, swimming in the warm sea, laugh and ride a surfboard. This genuine happiness sunny summer holiday was inspired perfumers brand Carolina Herrera to create a men's fragrance, able to convey a clean, fresh, summer, sunny aura. Carolina Herrera 212 Surf Men classified as fresh fern fragrance. The concept is simple - this statement perfectly reflects the sound of summer youth flavor. His pyramid is quite simple and ingenious: perfume notes the sea begins, in his heart clearly audible juicy, ripe grapefruit, sharpness and give pungent aroma notes of patchouli. The Carolina Herrera 212 Surf Men so easy to read the wind and the fresh sea breeze. 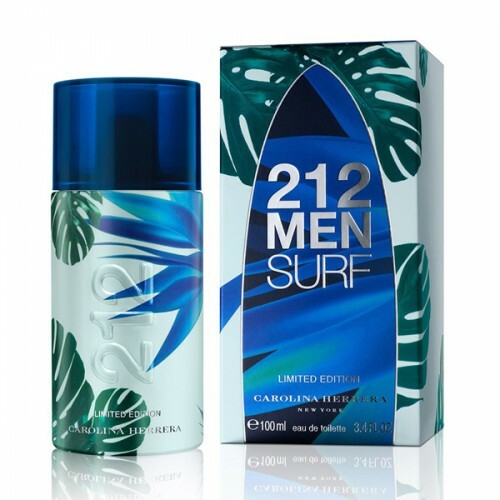 For the young and energetic eau de toilette Carolina Herrera 212 Surf Men is the best choice! Top notes: marine notes The note "Hearts": grapefruit Final note: patchouli. The fragrance opens with notes of grapefruit surrounded by aquatic tones and notes of patchouli leaves.